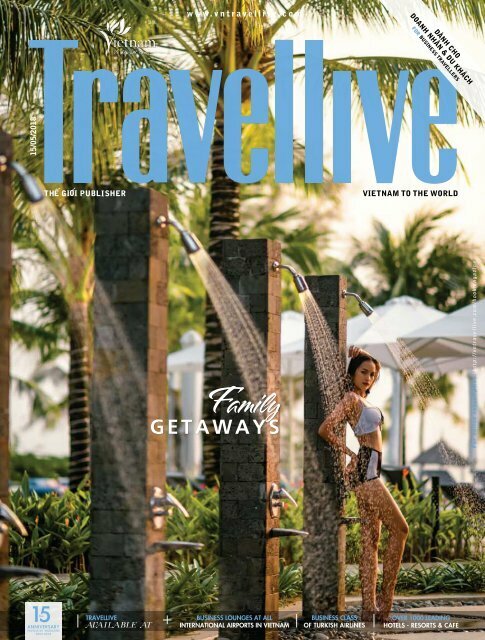 Content > 1 5 / 0 5 / 2 0 1 8 food&beverage - PHOTOSTORY - WHAT&WHERE - TRAVELLERS' OUTFIT - EVENT CALENDAR - TRAVEL - FASHION - LUXURY LIVING - HI-TECH - INTERVIEW V≠Ín QuËc gia C∏t Bµ 132 > HITECH NH~NG "BÅO BˇI" N£N Cï TRONG CHUY⁄N DU LëCH GIA ßçNH MÔa hÃ lµ thÍi Æi”m nh˜ng Æ¯a trŒ b≠Ìc vµo k˙ nghÿ dµi, dp Æ” c∂ gia Æ◊nh cÔng nhau tÀn h≠Îng nh˜ng chuy’n Æi xa, kh∏m ph∏ thin nhin... Chu»n b k¸ cµng cho k˙ nghÿ vÌi s˘ hÁ trÓ cÒa c∏c thi’t b c´ng ngh÷ vµ chi’c xe phÔ hÓp vÌi nhu c«u sœ khi’n chuy’n Æi cÒa bπn vµ ng≠Íi th©n c„ thm nhi“u tr∂i nghi÷m thÛ v. Travel musthaves for a family getaway The arrival of summer marks the end of a school year and the kids can finally go on a long vacation with their families to enjoy the beach, explore nature... Good planning along with the use of advanced technology as well as a good family car guarantee you and your family the most enjoyable experience on the road. 5 KHU NGHé MõI, HƒP D√N CHO MùA Há S§I ßóNG 57 > MÌi khai tr≠¨ng trong n®m 2017- 64 > 2018, n®m khu resort, kh∏ch sπn Æ≠Óc Travellive l˘a ch‰n sau Æ©y lµ gÓi ˝ l˝ t≠Îng cho k˙ nghÿ hÃ cÒa gia Æ◊nh. 5 new amazing resorts for your summer travel Five newly opened hotels and resorts in 2017-2018 have been picked by Travellive as ideal destinations for you and your family to enjoy this summer. 30 NGÄY CùNG CON L£N R\NG, LóI BIÕN CÉT BÄ Sau hai hµnh tr◊nh xuyn Vi÷t vµ Æi vng quanh c∏c n≠Ìc ß´ng Nam É, Æ©y lµ hµnh tr◊nh dµi ngµy th¯ ba cÒa ˇc khi cÔng bË mã vµo rıng, ln nÛi, xuËng bi”n. A 30-day learning trip in Cat Ba with our little girl Oc had been with us on two long trips. For her third journey and to celebrate her 3 rd birthday, we took Oc to Cat Ba and spend 30 incredible days there.